You can write a managerial reference letter if your employee has requested you to write a letter on their behalf. It would be imperative and appropriate for you to write the reference letter for a person who has worked very diligently in your organization. If a person has performed his duties well and has done all, those assignments which were assigned to him, then he deserves a reference letter from the manager of the company whenever he requests for it. The reference letter is usually demanded by those people, who are in search of a new job or new career opportunities. What to include in the reference letter? You should explain the capacity in which the employee has worked for you. This information is needed by most of the companies while hiring a new person. 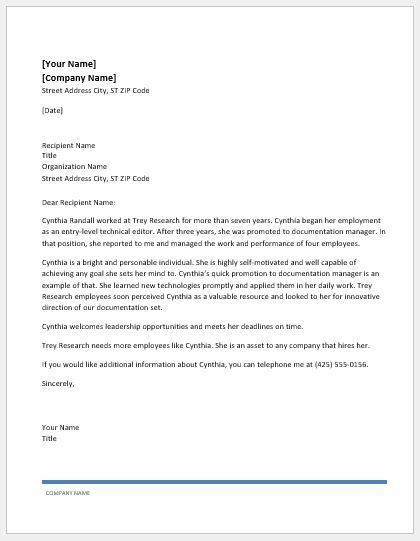 Since the reference letter is a type of document that is very useful for the employees, all the skills and attributes of the candidate should be represented in the reference letter so that the employees can easily get a job. Also, include your contact details in the letter so you can be contacted for any follow-up questions. The reference letter written by the employer serves as an asset for a candidate in his hiring process. If you employee has worked for you very passionately, then it is his right to get a reference letter from your company supporting the qualifications and skills of the person for the new job position he has applied for. Since it is a business letter, it would be better if you choose proper salutation to give it a professional look. It is also advisable to start the letter with your introduction and with the explanation of the type of relationship you had with the candidate and the reason for endorsing him. There should be a professional closing of reference letter with your signatures and designation. Following is given a sample template that can be used as a guide to writing a professional letter whenever you need it. You can use it directly in that case some customization is needed in terms of personal information.